This Italian inspired recipe is so simple and easy to prepare. Serve as a side vegetable dish with grilled meats, poultry or fish. 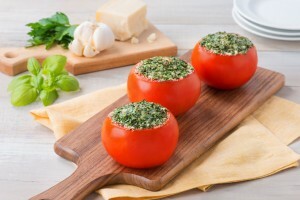 Remove the tops of the tomatoes, and scoop out seeds and pulp with a small spoon, cut off a slice from the bottom to prevent rolling and arrange tomatoes in a baking dish. In a small bowl combine the parsley, basil, garlic, and salt and pepper to taste. Stir well and spoon 2 tablespoons into each tomato. Drizzle with olive oil. Top each tomato with 1 T. cheese. Bake 20 minutes, or until soft. Serve at room temperature.